Acupuncture is a treatment with very thin, hair-like needles based on Oriental medical theory. In our body, there are rivers of energy called Meridians (Keiraku). Acupuncture regulates the energy (Ki) in these pathways to boost up our natural self-healing power. Traditional Acupuncture commonly uses sharp needles that are inserted into the body, apart from whether the insertion is deep or shallow. In my acupuncture treatment, a round tip neelde, which is called Teishin, is mainly used. The purpose of this needle is just to touch the skin to regulate the energy (Ki) - it will not penetrate the skin. In Eastern Medicine, it is considered that our body is controlled by 5 kinds of organs' energies which are Liver energy, Heart energy, Spleen energy, Lung energy and Kidney energy. Diagnosis is the process to find which organ's energy is weak and which organ's energy is blocked, and according to Diagnosis, the first part of the treatment will try to strengthen the weak energy and release the blocked energy, resulting that overall energy becomes balanced. At first, I ask what health issues you may have, and after this necessary information is given, start my assessment by touching diagnosis. You will be asked to lie face up on the treatment table. Standing by the table, I start checking your pulse, abdomen and other parts of the body such as neck, leg, etc. This is the most important part of the session because by touching your pulse, abdomen and other parts of the body, I discover which energy line is good to use and which points are good to use within the energy line. How can I know which points are good to use? When I touch useful points with proper way of touch, your body reacts a good way such as the pulse becomes softer and slower, the abdomen becomes smoother and softer, the muscle of your neck becomes softer. To make the effect stable, we use needles on these useful points. 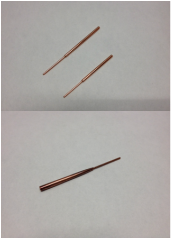 Regular Acupuncture Needles: This is a needle commonly used in acupuncture treatment. The needles I use are finest needles made in Japan. The needles are one time use, disposable needles. Teishin: This needle is thick and has a round tip so it won't penetrate the skin, and just touches the skin to harmonize the energy flow, leading to loosening up the tension of your skin and muscles. The needle in the lower chart is used to remove the remaining tightness which was not handled with the needle in the upper chart by tapping the area of tightness gently and rhythmically. Gentle tapping with this needle is very comfortable especially if it is done on the neck and shoulder area. Roller-shin: This needle removes the unevenness and light blood stasis on the skin. This is used mostly on the neck and back. Enshin: This is used to rub the energy lines on the neck and back. This activates the energy flow. First I will touch some acupuncture points on your legs and arms, which was lead as the best points to change your body to good way based on the diagnosis, with Teishin. This part of the treatment balances 12 energy pathways in your body. [Liver, Heart, Spleen (Pancreas), Lung, Kidney, Pericardium, Gall Bladder, Small Intestine, Stomach, Large Intestine, Bladder, Tripple Warmer] Weak ones get stronger and stagnated ones get smoother. By balancing your energy pathways, your immune system gets stronger because we consider that when your energy pathways are imbalanced, you get sick. After the treatment with Teishin, I will let you relax as you are, or retain needles on your back and then let you relax on the treatment table for about 10 to 15 minutes. You may feel sleepy. While you are relaxing (sleeping) on the table, your energy circulates to some extent throughout your whole body and your condition will be better than before relaxation, resulting in smoother flow of the pulse, warmer and softer abdomen and less tension in your muscles. After the relaxation, I remove needles on your back if needles are retained. If needles are not retained on your back, I do heat therapy called Moxa which gives you warm sensation of the heat. The treatment of the back includes your neck, back, hip and legs. On your back, there are energy pathways containing acupuncture points of each organs' energy, so it is very important to make these energy pathways flow smoothly. I will soften the tight area where energy stagnation is indicated by touching needle technique. After that, I will rub the energy pathways on your back from the neck to the lower back with the Enshin, which is a blunt needle with a big ball on the other, in order to encourage the proper flow of energy along the meridians (energy pathways). At this point, I will ask you to sit up or lie on your back again. I will treat your lower back and/or neck and lower abdomen with the Teishin. Typically, these areas are easy to stagnate. I will loosen up the tightness in these areas in order to promote a better free-flowing circulation of energy on the front of your body better. A part of this part of the treatment is shown in YouTube video at the right upper. At the end, I touch some points of your abdomen and draw circles with my hand. This makes the effect of the treatment last longer.